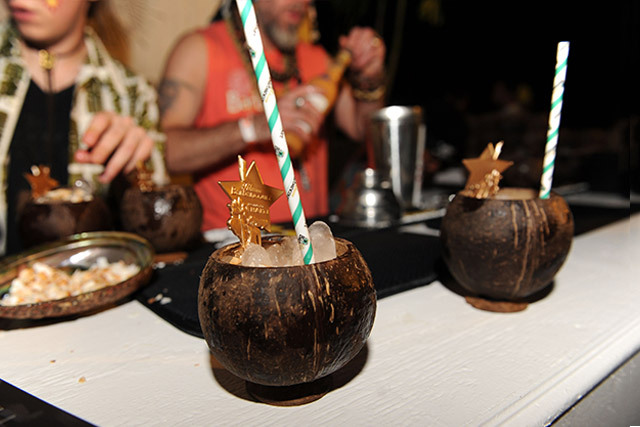 The Art of Tiki: A Cocktail Showdown went down, with the sun, last month during the 16th Annual South Beach Wine and Food Festival (SOBEWFF) held in Miami Beach, Florida. 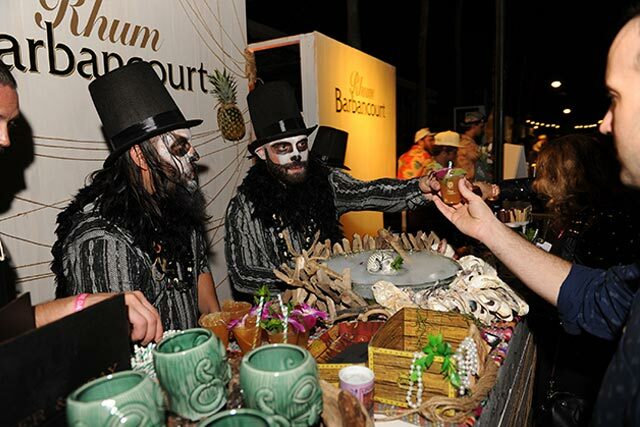 The tropical-themed cocktail competition, hosted by Food Network personality Robert Irvine and sponsored by Rhum Barbancourt, featured bars from around the country and their specially created tiki -inspired entries. 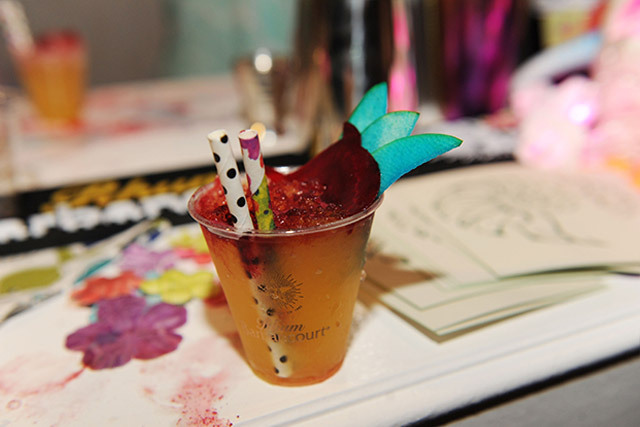 Bartender contestants shook and stirred concoctions, often in costume, at their decorated mixologist stations that framed the beautiful pool at Kimpton’s Surfcomber boutique hotel on South Beach’s famous Collins Avenue. 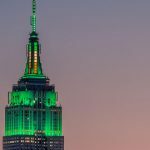 The judges for the tiki cocktail showdown included, from Las Vegas, Southern Wine & Spirits’ Executive Director of Mixology & Spirits Education, Francesco Lafranconi, and Tales of the Cocktail founder, Ann Tuennerman. Rhum Barbancourt White Rum, Absente Absinthe Refined, Green Apple Juice, Cinnamon Syrup, Passion Fruit Syrup, Lime Juice, Beet Root Powder. Garnished with Green Apple and Beet slices. Rhum Barbancourt 3-star (aged 4 years), Rhum Barbancourt White Rum, Lustau East India Solera Sherry, Kay Ki Fet Ginger-Creole Falernum, Passion Fruit Puree, Seville Orange Juice, and Herbastura. Garnished with grilled, pickled Plantain, edible Orchid, Bokor’s Paddle and Mint Sprig. The People Choice is awarded to the mixologist station which received the most tokens from guests. hand beaded Rhum Barbancourt Bottles done by Haitian artists in Haiti, and a bottle of Rhum Barbancourt Limited Edition Cuvée 150 Ans packaged together in a Rhum Barbancourt barrel chest. Winners also will receive their ‘Winning Cocktail’ featured on the Tales of the Cocktail website and Tales 365 memberships. Coconut Roobios Tea-infused Rhum Barbancourt White Rum, Long Hot Coconut Cream, Don’s Spices #4, Pineapple Juice, Orange Juice, Lemon Juice. Garnished with Toasted Coconut Flakes, and served in a faux Coconut Shell. Naturally, as the cocktail was created by the event’s sponsor, it was not an eligible cocktail contest entry. I also really enjoyed sipping Beaker & Gray’s People’s Choice winner, The Bokor’s Zombie and the Jacmel Jet Pilot from collaborators, Broken Shaker and Bar LA. Rhum Barbancourt 3-star (aged 4 years), Rhum Barbancourt White Rum, Housemade Falermum, Lime Juice, Grapefruit Juice, Cinnamon Syrup and a splash of Absente Absinthe Refined. 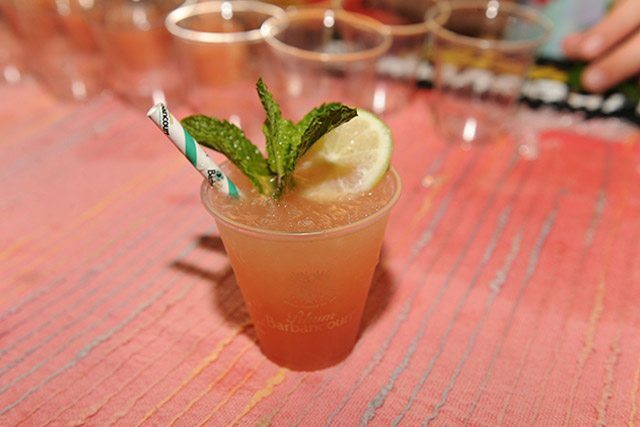 Garnished with Mint, Parachuting Cinnamon, Lime Wheel and Bamboo Straw. There was also a selection of tasty Polynesian-inspired bites prepared by local South Florida restaurants. My favorite, from The Social Club at the Surfcomber, was Chef Brian Wilson’s ‘Local Fish Tacos’ – Blackened Mahi Mahi topped with pickled Mango Salsa, Jicama Slaw and Miso Buttermilk sauce on a soft corn tortilla.